Taste test: These round tortilla chips came in red and green, but as far as taste, they were just like ordinary Tostitos. Smell test: Smells like tortilla chips. 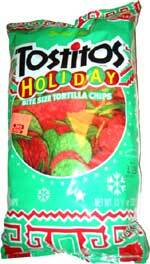 Trivia: Tostitos Holiday are advertised as limited edition. This snack was discovered by Keith and Melissa at Target.